See also Star Wreck Intergalactic by Elementalist, Star Wreck: The Next Generation by LexKominek. My version of a Star Trek logo font. I only used Horizon as a guide when I couldn't find a good solution to a letter (e.g. Q). Looks good at pixel size. Info: Created on 14th November 2009 . Last edited on 25th November 2009. Congratulations! FontStruct Staff have deemed your FontStruction worthy of special mention. “Star Wreck” is now a Top Pick. I thought Top Picks were supposed to be Original designs, and not versions of another font? Having had my NCD Neopolicia Top Pick revoked a wwhile back. Isn't this a case of double standards? That Star Trek font itself seems to be a verbatim repackaging of Bitstream’s Horizon, which Lex already references in his description above. I have always understood that top picks are chosen based on a number of factors, originality not necessarily chiefly among them. I myself find it most interesting that Lex took (I assume) the all caps logo of STAR TREK as a staring point, worked carefully to repeat the major quirks such as the lightning bolt spine of the S and the similar diagonal crossbar of the E, and yet arrived at a much more well-mannered, less display-oriented set of characters with a lower x-height and many fewer twee diagonals in the lc. Horizon and “Star Trek” seem clearly suited for titles (corny, corny titles), where as “Star Wreck” could function well for small blocks of text. Personally, I don't care if this is a top pick or not - it's just something fun I did to celebrate the new Star Trek movie's DVD release. I'm not knocking this font. I just want to know what the rules are. The edges are very blurred. You guys obviously missed the discussion about this. I had my Top Pick NCD Neopolicia Harlequin revoked a while back for a much lesser similarity, for a font based entirely on, what I thought at the time, was a Logo for a company called Grant. Check out the link above, you'll see where I'm coming from. For sure. I've also done Fontstructions that are way more closely based on existing fonts (Wotan, Serpentlike) which have also become top picks. So have I, but since the NCD Neopolicia Harlequin scandal, whin at positions 1,2, & 3 of the Top Picks, then boom, it was removed. It seems a little unjust that what is good for this Font is not good for my font. It is simply an unfair decision. I think the rules need to be clearly defined, as what is good for one should be good for all. @Nippa: I did read all the goings-on around NCD Neopolicia Harlequin a while back. And what drama! Surly you still have unresolved thoughts and feelings about it. It’s just almost always been clear to me that the rubric upon which top picks are chosen is...well, arbitrary when it comes to fairness and certainly not rigorously applied. How can it be when, to a greater or lesser degree, it’s purely a matter of taste? All fonts are ultimately derivative, there’s simply no escaping it. Having a TP removed: that’s another matter entirely – one single matter – and a rather sad one at that. I have empathy for your pain and frustration :(. Everything you contributed and what were you given back? How to not take it as a slap in the face? Yet Gustavo surely experienced decisive pressures that we can’t fully understand to have taken such singular and ponderous actions. Who am I to say, really? But I believe it to be because the world of design is certainly full of its own politics just as is any business. So please stop shooting the messenger. We take it for granted that this is some kind of free workshop or playhouse, a place in the “virtual social networking commons” where we have our dignity and our creative entitlement (and, alongside these, our addictions and growing pains and the elaborate ways we joke to cover them up). But no place in this universe is free; we are all constantly in relationship and with that comes profound responsibility. This responsibility is to each other and especially to all the other-than-human beings of this world. Even if we chose to look the other way again and again and again. So this place, remember, is a 2009 AD business storefront. In its own way. Take a case like NCD Neopolicia Harlequin (quite the name, by the way) and one can ponder for a very very long while what exactly is being made and sold here. What “resources” are being tapped? How is the sphere of influence of such an endeavor going to expand like any such invention or organization must to be considered “successful”? Truth be told: But for a few notable exceptions, the fellowship of fontstructors have proven quite uninspired at the task of promoting their own work in the way that other, perhaps less bookish, folk seem to so lust after hawking and perpetuating images of themselves. I see fontstructors digging each other, friending each other, tweeting each other. I see artisans who have (re)discovered their vast need for authenticity and are still searching for it in the most abstract of ways. There may be other reasons for this deeply insular phenomenon, but I will not venture more such guesses here. To bring it all back, it would be patently false to maintain that the recognition of top pickdom is awarded only to fontstructions that are original. I fontstructed an almost exact replica of Büro Destruct’s bd medled (except for designing a more proper ampersand and for fontstruct’s sometimes frustratingly imprecise geometry) that I called Med Led 1.1. I gave all proper credit, called it an homage in the description, and tagged it with the original designer’s name. How much more derivative can one get? BD medled was designed in 1995, which makes a difference in this case. Now, all you can see of this series here is paul d hunt’s creative and trippy clone of a clone Med Splode. The motivation driving this fontstruction was to play with/demonstrate brick substitution and filter tricks, which was fun, noteworthy and innovative at the time. Yet Med Led 1.1, the most derivative, the least original of the pack also received a top pick. Each case is always concurrently unique in reference to others. Impeccable rationality and absolute consistency are quite simply too much to expect from a human. @djnippa: Top Picks are chosen based on a number of factors, originality being just one of them. It is a subjective decision - but so is rating, and so is any art direction. The edges are often blurry for me too. I the case of Neopolicia, I have explained why the Top Picks have been revoked. Let's move on. Sorry but let's not move on, because it is obviously still unclear. Neopolicia was revoked because you said, and I quote "While we’re happy that FontStructors are inspired by the work of other type designers, sometimes the similarities are too great to merit a Top Pick." If that doesn't apply to this font, I don't know what does. Well, you just explained it — I don't consider the similarities big enough in this case. But most importantly: the two contexts are very, very different (see my ABC questions on the Neopolicia thread). Regarding my criteria being “obviously still unclear” — you are the only one complaining, really. I have actually received several emails with compliments for my Top Pick choices. Please understand that I owe explanations to the FontStruct community as a whole, not to you individually. If FontStructors are unhappy about my Top Pick criteria, speak up! But if it's only you complaining I will move on, because time is short and there's plenty of work to be done. I usually try to avoid conflict, but I can't let djnippa go it alone on this. If NCD Neopolicia had never received a Top Pick, I would have been surprised, but then I have been surprised by many Top Picks (including some that were given and some that should have been). But, NCD Neopolicia did receive a Top Pick and then it was quickly revoked with a rather confusing explanation that does not seem to be applied universally. In fact, as far as I know, NCD Neopolicia is the only fonstruct to have a Top Pick revoked. I hope that Lex (and any others where this conversation has come up) understands that it is not about his font not being deserving of a Top Pick. I think Star Wreck is a good font and deserving of a TP. My concern is with the lack of consistency in the application of the unwritten rules. @aphoria: No, the Top Picks were given for Grant, not for Neopolicia. And Grant is a recent, original, very distinctive display typeface which is distributed commercially. 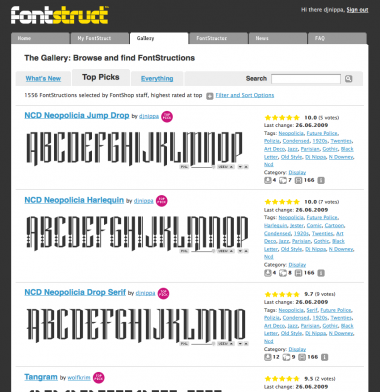 @FontStructors: Do you think the application of Top Picks on FontStruct is inconsistent? Do you think there are undeserved Top Picks, or unjustified unpicked FontStructions? Do you have ideas on how the system could be improved? Let me know. @gferreira Huh? NCD Neopolicia Harlequin had it's Top Pick revoked. Grant isn't even a fontstruct, unless I'm badly mistaken. I was very disappointed when I found out that the features I had considered special in Neopolicia were in fact features from Grant. This is hard to dispute unless we are to get all sociological about the source and quality of Gustavo’s disappointment (See my post above. Actually, don’t; my musing on such are lost here). Friendly fontstructors rallied to djnippa’s defense with the assertion that the NCD Neopolicia series is more useable when compared directly to Grant because of its less strikingly elongated structure. Well, ok there are differences. But these are both display faces and as a general rule of knocking the critic’s socks off: If you are going to go big go big. Yet the most obvious motivation for taking the extreme and unfortunate action of revoking a top pick (mind you a very small gesture on the part of FontShop, but one that takes time and attention nonetheless) is the fact that Grant is such a contemporary design. I won’t peer too deep beneath the surface of business politik, but clearly FontStruct – and by direct associate FSI FontShop International – can’t be seen promoting free derivatives of new, competing, type designs that are still building steam in their viral pursuit of customers, prestige, mindshare, etc. There’s a simple question here: What’s the difference between a rip-off and a revival. And the answer is even simpler: Time. @aphoria: That's precisely the point: there was a lack of attribution and one thing (Neopolicia) was perceived as another (Grant). This is where I think the line should be drawn. Here is an interesting essay about this topic: Call It What It Is, by John Downer. @will.i.ૐ If that's really what Gustavo meant, then I can only say that it is utterly ridiculous. He's actually claiming that the Top Pick was awarded to Grant because NCD Neopolicia Harlequin was based on it? What was the first font ever created? Let's just award that the Top Pick and forget anything going forward. If the revocation was politically based, why not just say so instead of bashing djnippa's integrity and implying that he had done something wrong? I have a suggestion for Top Picks...let us decide. I've mentioned this idea on at least a couple other threads, but it has never even been acknowledged. There are many ways it could be done. Maybe each person that has at least 3 Top Picks of their own is allowed to cast a Top Pick vote for a font. When font gets 3 Top Pick votes, it get the Top Pick badge. The numbers could be changed and even the rules. Maybe call it a Peer Pick instead. Here’s the link Gustavo was going for. Thanks Gustavo, these seem to be some good essays I had previously missed. @Aphoria: The merit of top picks and how top picks are awarded are actually completely different discussions, which is why your suggestion has never received official acknowledgement. Outside of fontmoot (haha, funny name :), it always comes up as a suggested resolution for dealing with contentious top picks. It is not a direct solution, because FontShop will never give up that degree of control. Chaos would reign, neh? What’s also been discussed (and what I feel like you are really talking about) is amending the system with multiple badges: top pick, community love, brilliant grid-busting, usability (except for metrics/kerning pairs) plus, etc. But that functionality is already satisfied by the comments section. My sense: the community is way too small, the overhead way to high, and the staffing way too sparse to really allow for such changes. You might say, “But I am suggesting we do the work,” but this is really not the case. Complicating the system is one way to ensure more work for the system’s programmer and maintenance crew. If we could actually see Rob and company’s road map for FontStruct and the anticipated time for unveiling incremental upgrades, I think this would be eye-opening. Of course we won’t; it would be very unwise to make such commitments and then be unable to deliver in a timely manner or at all. P.S. Lol, Lex’s inbox is blowing up right now. Sorry, Lex! @will I'm not sure you can separate the merit from the method. I know my suggestion isn't without drawbacks, especially for FontStruct. They need to decide what's more important: complete control or community involvement. The current system is not scalable, and in fact is already operating beyond it's scale. It is just not feasible to have one person reviewing all new fonts and selecting Top Picks. I don't think the comments sections fulfills quite the same need as Top Pick badges or possible new badges. The badges make the fonts searchable by badge type...not really feasible with comments. How do I search by comments and say "show me all great fonts"? I'm not trying to bill my idea as the ultimate solution, but they keep asking for suggestions, so an acknowledgment would be nice, even if just a "thanks, but no thanks". It stinks of a poor call and really bad judgement from every angle. You say you don't consider Star Wreck similarities big enough in this case! For fucks sake LexKominek himself states that his fontstruct is based on Star Trek Logo/Horizon - yet remarkably you don't see the similarities! They look exactly the same. I originally stated that my NCD Neopolicia was based on a logo, I had 5 letters and a few more smaller blurred ones to go on. The rest I created. NCD Neopolicia has far more differences than Star Wreck has to Horizon. It's very confusing, and bloody annoying. I too am looking out for all those on Fontstruct, I help and tutor those who need it. I go out of my way to show people how to properly space fonts. I advertise this site in many ways. I spend time putting educational fonts on the site. I am hard working and honest, yet to play the game properly, to give the best of my abilities, and to help others along the way - The rules should be clear, and fixed..... that is what I understand. What is unclear is why you don't stick to the rules you preach? It's really fucked me off, that what is right for one, is not right for all. Ok, I read the essay. Maybe I'm just dense, but I don't see how it applies to djnippa, but not others. I have proposed a community-driven approach to Top Picks (and to Featured FontStructions) a couple of months ago. It’s on our roadmap, but I don’t know when it will be implemented. Simply take it on the chin, and except that it was a poor decision, who ever made it. ok, already. as someone once told me life is unfair and logic does not apply. gus has stated his reasons. people still disagree. can we move on? this is really a drag. redirect the negative energy and make it a positive - create a new font or something. enough is enough. disagree and be a gentleman. rudeness is not called for. DJ: No one has to tell you that you do good work; you know that yourself. Three less Top Picks does not alter the respect you claim. But, frankly, going on about this issue does not help your cause. Do yourself a favor and let it go. We still love you the same. Aph: Your support of DJ is admirable. GF has done all he can to explain (with surprising calm) his views on this issue. As you, I too am still confused on the criteria, but lets just let it be. A Top Pick is an award just as an Oscar is an award. No one questions of the Oscar awarding body why one person got the award and the other four did not. Let us amateurs put our faith in the professionals whose sole business it is to know fonts. And if it seems like I've sold myself to the establishment, I invite the FontStruct administrators to review all my current and past Top Picks and remove any or all of them as they see fit. I won't complain. If a referee kept changing the goal posts you'd be upset as well. I hope you can understand where I coming from. It's not about NCD Neopolicia, I'm just using that as an example in comparison. It's about conflicting decisions. double standards, confusing inaccuracies and blatant plagiarism. The vagueness of the reasons for removing the Top Pick are disappointing enough, but I am sorely disappointed that no one else has spoken up in defense of djnippa. It is not the just the removal of the TP that bothers me, but the implication that he is somehow a liar, plagiarist, and deceiver. Who would have thought that such a stupid font would spark such controversy! Anyway, I consider Fontstruct a fun and free way to make cool little fonts, and to share them with the world. I'm not going to get worked up if my Top Pick gets revoked, especially if it will put an end to all of the fighting. Where's the love? I don't understand why all these arguing about Top Picks ! It is not a competition, there no prices to win, and, I dare to say, no pride in it. After all, Top Picks are nothing else than reflecting the personal and subjective taste of the person(s) in charge of it at the Fontstaff. I respect their taste and choices, but it is not telling more than that about the fonts. Personally, maybe because my taste is uncanny, sometimes I totally agree with Top Picks and I adore the font, sometimes I don't feel anything in front of them. There is no point in rehashing it all again.